Charge mobile phones from work computers. Keep mobile phones in charged and operating state at the end of a work day. Team can have improved availability by mobile phone. Avoid buying second phone chargers for work. Avoid having to find extra power points to charge phones. Avoid having to have extra phone chargers tested and tagged in the workplace. 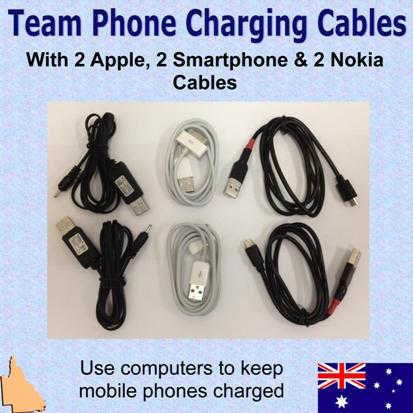 Phone charging cables can also be used from laptops while travelling. Smartphone and Nokia cables can work from any computer USB port without data transfer. Other Smartphones that use Micro USB charging will also be compatible. Micro USB charging standard in China and Europe has been adopted by Nokia, Samsumg, NEC, RIM, Motorola, Sony Erricson and LG.